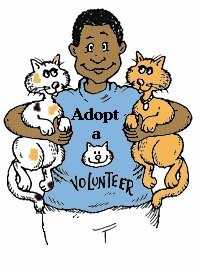 We need volunteers for shelter cleaning, trapping, cat transporting to and from vets, adopting out our cats at pet stores, fostering, handyman (carpenter, electrical, etc. ), fundraising, television and radio media professionals and celebrity spokespeople to help promote Adopt A Cat Foundation. Call Inga at 848-4911. Adopt A Cat Foundation (AAC) conducts scheduled monthly meetings that fall on the last Tuesday of every month at the North County Public Library, which is south of the Gardens Mall, starting at 6:30pm.